In today's world, the ability to consciously create focus is a tremendous strategic advantage. If you master that, you are a shark amongst minnows, a crocodile amongst turtles. I want to look at a goal the way Jefferson looks at a cat. 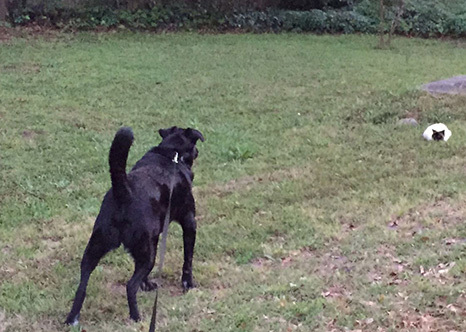 Jefferson is a sturdy, athletic black lab mix, and the clinching chain around his neck is completely ignored as he strains with all his 85 pounds after the feline frenemy. A plane could crash into a nearby house and he wouldn't notice. How often, though, do we humans get that kind of focused drive in this age of distraction? According to a recent study, our personal symphonies of attention scattering alerts are a one trillion (yes, with a T) dollar problem. So, it seems to me that, in today's world, the ability to consciously create focus is a tremendous strategic advantage. If you master that, you are a shark amongst minnows, a crocodile amongst turtles. Learning to calm your rational mind and separate from your thoughts is a powerful way to learn to manage your attention and where you direct it. I've seen a lot of definitions for meditation, but to me, they all have the common goal of finding the place of deep inner silence. Practice physically relaxing and mentally clearing your thoughts for at least 20 minutes a day and you will find your ability to put your attention where you want to improve. . . in addition to the myriad other benefits to your health and well being meditation offers. Take time to sharpen the saw and you’ll cut the trees faster. While it seems counterintuitive, intentionally planning time to be available to the interruptions from your beeping phone and binging laptop will help you calibrate the difference between being focused and being distracted. Becoming familiar with the difference between these two states means you can more readily adjust yourself to where you want to be. Try scheduling a half hour once or twice a day to respond to all distractions as if they were important. After a while, you might even find this hard to do, as you better learn the value of the state of focusing on one important thing at a time. I am far more productive with software development when I take 10 minutes out of every half hour to play guitar. It gives the "left brain" a rest and I return to the work refreshed, often with new ideas that seemed to unconsciously gestate as I took this "creative rest." You may not be a musician, but you can get most of the same benefits by listening to music, doodling, or whatever else triggers your creative feelings. And if you don't have a creative outlet you enjoy, this would be a opportunity to explore and integrate a creative endeavor into your life. I'm sure there have been times in your life when you have been fully absorbed in an activity. I became more familiar with my own state of absorption when I was riding motorcycles: situation awareness can save your life when you are on two wheels in a sea of texting SUV drivers. Weight lifting is another activity in which I have had experiences of deep concentration. Think back through your own personal history and find some specific times where you were deeply absorbed in what you were doing. In your imagination, step back into those times and relive them, one by one. What were the common factors? Did you see what you were focused on in a particular way? How did you talk to yourself, or did you? What feelings accompanied these times? Now, imagine how much more productive you will be by having that state where you want it in the future, seeing things the same way, hearing the same way, and feeling the same way. These four methods are but a small sampling of all the ways you can build the mental skill of focus and emerge the victor over the endless stream of distractions we live with. How much more can you do with a highly developed skill of concentration that is there when you need it? How much more satisfaction can you gain from being fully aligned with what you intend to do? What is the first thing from this list that you can practice today to affirm to yourself you've made the decision to master awareness?